Our car / auto locksmiths are aficionados when it comes to knowledge of Autolock design. Having undergone rigorous training and assessment before they are entitled to trade under the Lockforce banner, each of our technicians will endeavour to solve every lock problem with which you are blighted. 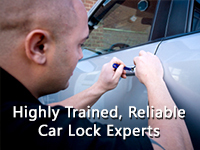 We are experts in car lock picking and our investment in non-destructive techniques ensures that, in the vast majority of cases, we will enter your vehicle without causing any further damage. Our key cutting service is second to none, meanwhile our emergency response code ensures that a highly trained auto lock technician will attend to your call out whatever time of day or night. Our team is on standby, waiting to help you. Please call us on 03301225027 now.